Hiking and backpacking with your dog is a rewarding way to spend time and bond with your pet while enjoying our natural world. It is such a great feeling to know that your best friend gets to spend their weekend and vacation time with you! 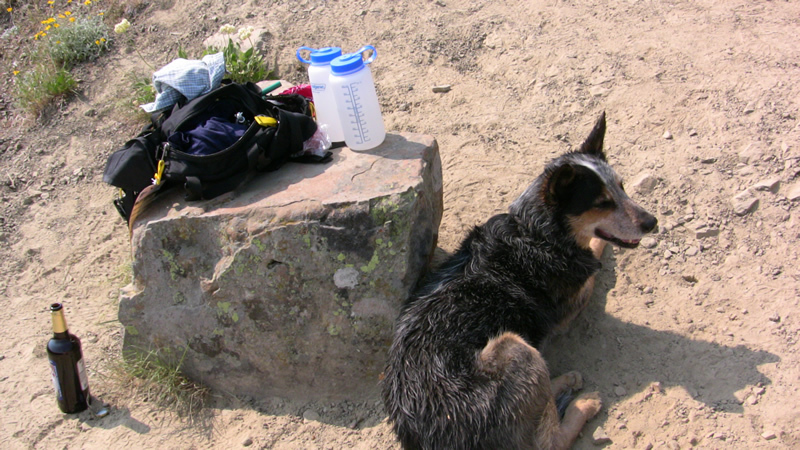 Hiking and backpacking with your dog also adds quite a bit to the list of responsibilities that comes with dog ownership. There are many more dangers to face than what you may come across at the local park or in your backyard. Dangerous terrain, climate, animals, plants, swift water… the list goes on and on. Let’s take a look at some things to consider and prepare for when hiking and backpacking. The first thing to consider is whether or not your dog is allowed to be where you want to go. Keep in mind that dogs are not allowed in some National and State Parks or in some campsites. Always check online or call in advance. In many areas dogs are allowed but are required to remain on leash. Be sure to follow these rules for safety reasons. 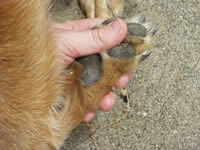 It is reasonable to assume that dog aggressive dogs may be hiking the same trails as you are. On the flipside, those of you with dog-aggressive dogs need to understand that when you are in areas that do not require leashes, there will be off leash dogs. Don’t put your dog in a situation that it cannot handle. 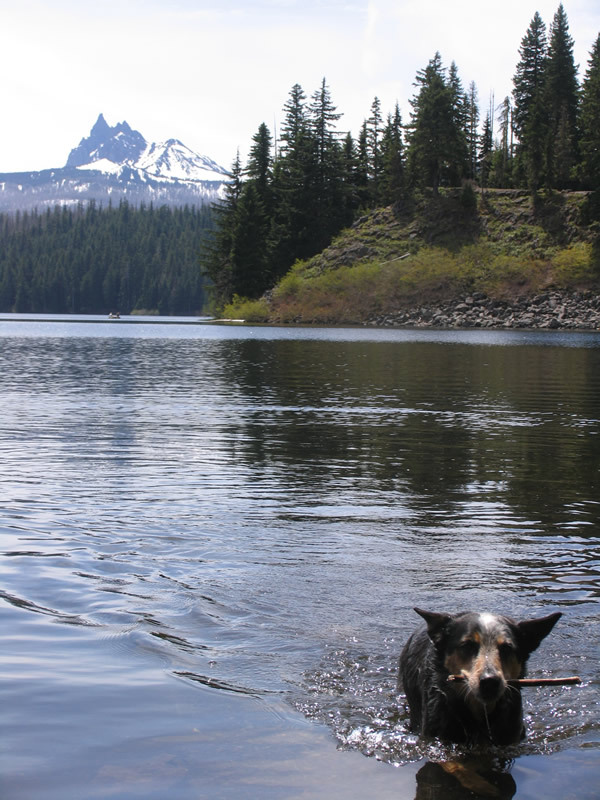 Who should NOT go off leash hiking? •Dogs who are dog or human aggressive. There are some dogs that with the right temperament and training have become trustworthy dogs on hikes. This dog must be able to tolerate a naive dog or person that gets into its personal space. This achievement takes a special dog. Most dogs who have aggression issues, even with training are not going to be successful in an off leash situation. If you have a dog with aggression issues and you want to be able to better manage and control your dog while at the same time making him or her more comfortable, call me at Cooper’s Dog training and Behavior Modification. • Dogs that are prone to run off either by breed type or past behavior. Many hounds and terriers are apt to disappear once they get on the trail of something interesting. Once they’re off, they’re gone for a long time. Husky and other Nordic breeds also tend to be unreliable off leash. Technically, they have been bred to turn away from you and run, haven’t they? As with everything, there are exceptions to the rules. • Dogs who are untrained and/ or young. 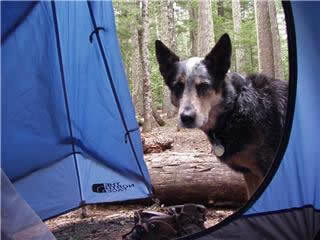 • Dogs who are physically unprepared or unable to handle a hike. 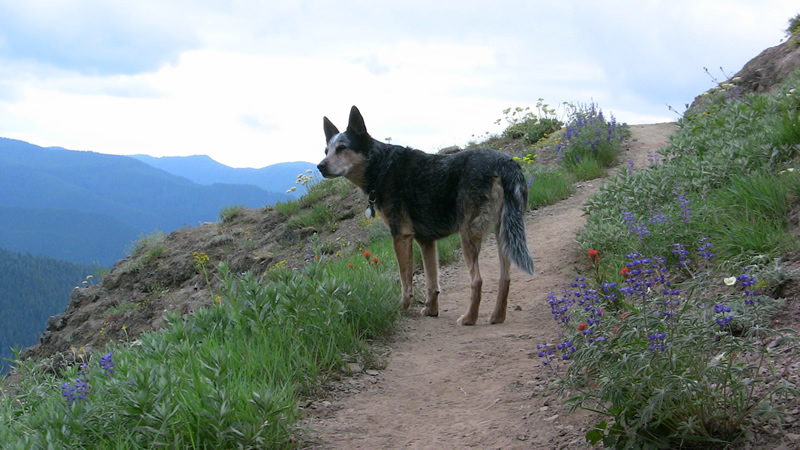 When taking your dog hiking and backpacking off leash, you MUST have voice control over your dog to keep your dog as well as other people, animals and the environment safe. When you take off that leash, you are taking more risk. …and many others that have proven to be helpful. Call me at Cooper’s Dog Training to work towards your goal of off leash control. Is your dog in shape? Many hiking websites describe the terrain. Be sure that it is something that your dog can handle. Be aware of cliffs and drop-offs as well as loose soil. Be prepared for changes in the weather due to chance or altitude. Rain, snow, heat, cold, flash floods… Be prepared. 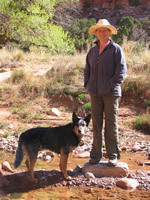 snakes, cougars, bear, ticks, mosquitoes, deer, fish, horses, other dogs, giardia! These things happen! Especially in the Northwest, you must be very careful about dead salmon. If your dog eats a part of a dead salmon, the risk Salmon Poisoning is very real. This is caused by a bacterium that is associated with a parasitic fluke of some PNW fish. Check out the links at the end of this page to find more information. some dogs like to graze now and then and can ingest poisonous plants. How conditioned are your dog’s paw pads? Will you be on ice and snow for prolonged periods? Do you have first aid for your dog? Do you have pain medication and anti-inflammatory medication just in case? • A light that you can attach to your dog’s collar. I like the “Bling Bling Blinkers” available at almost every pet store. These LED lights can be seen up to ½ mile away! • Dog Backpack (Optional) must be well fitting and never weigh more that 10% of your dog’s body weight. • Dog collar with Identifying tags with your cell phone and a friend’s number on it. I keep my cell phone number on the tag so I can be contacted if my dog is lost near my location. I also keep a phone number of a friend or relative on the tag in case I am out of cell phone range when my dog is found. This person should be someone who knows where you have gone on your trip. It is also a good idea to have your dog micro-chipped in case the collar is lost. • A picture of you and your dog. This has been recently brought to my attention. As much as we don’t like to think about it; there are bad people in this world who would try to claim your dog as theirs if they wanted it bad enough. If the authorities are called and you produce a photo of you and your dog together, you get your dog back right then and there. I suppose that photos of my dog in various settings on my phone would have the same leverage. • Dr. Bronner’s Lavender Liquid Castile Soap. You could use another scent if you wanted to, but after your dog rolls in something rotting or animal excrement, you will thank your lucky stars that you remembered this biodegradable, vegetable based, fair trade and super potent soap. Trust me. Camp suds don’t even come close to this stuff in an emergency olfactory situation in the middle of nowhere. This page is still being worked on. Check back soon for more Hiking and Backpacking links and information!